One challenge that Denis Diderot struggled with in the creation of his 1751 Encyclopédie, and his attempt to catalogue all that was then known and preserve it in case of a great cataclysm, was how to satisfactorily record craft skills. There is far more to collective human knowledge than facts and theories, and practical expertise can’t be faithfully captured with the written word alone. 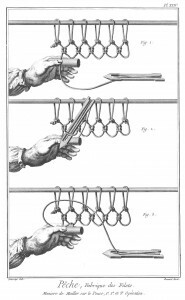 He tried to address this problem by providing great numbers of detailed illustrations depicting key procedures and the dedicated tools needed, such as the one to the right on how to make a net. But imagine if Diderot had access to the online services we have today like Vimeo and YouTube, which make the distribution of short films absolutely facile. Many of these, of course, are cat videos, but there is also a huge resource of practical demonstrations and How-To films. Here’s a selection I’ve compiled of some of the most interesting how to guides. But if you intend to refer to them after the grid goes down, make sure you’ve saved them off-line first, perhaps using one of the apps listed here.